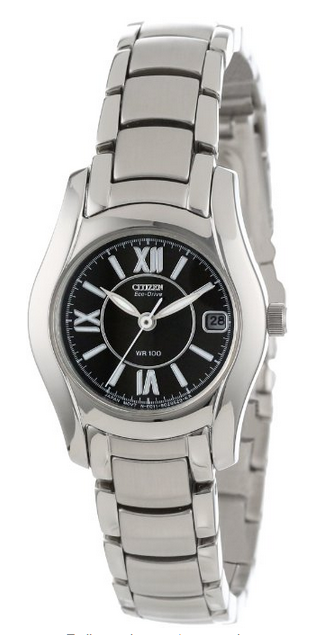 citizen eco-drive watches are awesome. they’re powered by natural and/or artificial light which means you never have to replace another watch battery, and unless you stick it in a drawer for more than 6 months, it’ll never stop – and even if you DO stick it in a drawer for more than 6 months and it stops, a couple of minutes under a light source will start it up again, with a full charge taking about 8 hours (but that can be done simply by wearing it). i’m a total eco-drive convert. i’ve had it for a few years now and i love it, i truly do. it’s unassuming, it’s comfortable, it’s casual enough that it doesn’t look out of place with a pair of cutoffs and a tank top, but it’s classic enough to wear when i’m a little more dressed up… AND, and this one is a biggie for me (in addition to never having to replace another watch battery), it’s waterproof to 100 metres. i can jump in the river without worrying about fecking it up! i wear it every day. if i had one complaint, it would be that the date window is too small for me to read but frankly, i couldn’t care less about that, so i’m not complaining – i’m just sayin’ – and anyway i have other ways of finding out the date if i REALLY need to know it, which isn’t often. so yeah, i absolutely love my watch. …and then i saw this one (OMG! ), and my heart nearly leapt out of my chest (not really, i’m just trying to make a point). it’s gorgeous and i want it. it’s larger and fancier than the one i have, but it has the same great functions of my existing one PLUS the chrono features, and it’s all stainless and ceramic and diamonds… and i love it… and i want it. JUST LOOK AT THIS THING! isn’t it beautiful? i kinda feel like i should say, at this point, that i am NOT a spoiled little princess. i’m really not (i swear i’m not, not really), but i do act like it sometimes… but see, i said in a previous post about how i decided some time ago that i don’t need a lot of stuff, but i want the stuff i have to be quality. i’m a function-THEN-form kind of gal, and this watch has both. it’s not just sparkly, it actually does stuff. it’s a bit pricey at £299 here in the UK, but it’s slightly cheaper (with the current rate of exchange) here, on amazon – please note that the pictures on amazon don’t do it justice. the picture above, from the citizen website, is far more accurate. soooo… i have a birthday coming up in a few months from now. it’s in july. yaknow, in case anyone was wondering. 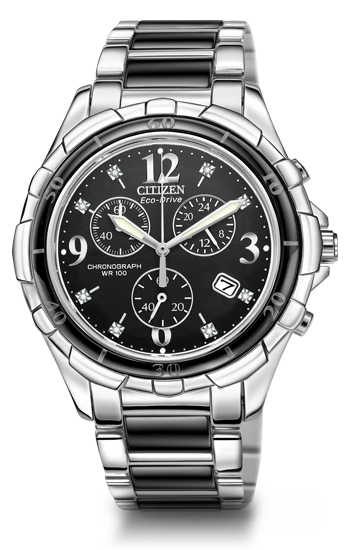 This entry was posted in fashion, i fancy this one, luxury, the world's greatest and tagged chronograph, citizen, eco-drive. Bookmark the permalink.